Two ongoing projects in the Architecture Library and the Drawings + Documents Archive at Ball State University are making use of new technologies to augment the collections, engage the students, and raise the profile of these branch operations of the University Libraries. Physically located in the College of Architecture and Planning’s Architecture Building on campus, the library and archive are well-situated to provide collections and services to the students and faculty members who make up their primary user group. As these users incorporate new technologies such as 3D modeling software and 3D printing into their projects, staff in the library and archive have sought out ways to use these same technologies to interpret the collections. Example of a Revit file from the project featuring a bench from Keystone Ridge Designs catalog of site furnishings. In the Architecture Library, student workers in the Visual Resources Collection (VRC) are creating files using the 3D modeling software Revit for items in the Building Material Samples Collection. Begun in 2009, the Building Material Samples Collection makes innovative and sustainable materials available to students and faculty for study purposes. Items may also be checked out for four days and taken to studio or displayed during presentations. The collection consists of more than 600 material samples for surfaces, structural or technical building components, hardscape products, and more. In addition to samples, the collection also contains product literature for materials that are too large or unwieldy for the manufacturer to produce samples. It was the items in this last category, the ones that are too big to be samples, that were the inspiration for the VRC’s growing collection of Revit files. A student worker suggested making Revit files of these objects that users could incorporate into their 3D designs in the same way that they can use objects from the file-sharing site Revit City. The library staff immediately recognized the value in enhancing the usability of the materials collection, we were able to work out the details of storing and accessing the files, and thus the Revit project was born. Students can now download the files of street furniture, lighting, and other materials from a library server (which is password-protected for use by current university students and faculty members) and insert the objects into their projects. A jpg of each item provides a quick view; once downloaded, the Revit version of the file is fully integrated into the project and can be manipulated with the tools available in the software. If a student wants to use the file in a different program, he or she can open the file in Revit (using this software on a library computer if he or she doesn’t have a copy), save it in another CAD format, then import the file into a program such as Rhino or SketchUp. Example of a Revit file from the project featuring a drinking fountain from Most Dependable Fountains catalog of outdoor products. The next phase of the Revit project will see the addition of surface materials from the collection that can be applied to surfaces on a building or object in Revit. There is a range of standard materials available in Revit, but now students will be able to easily apply the unique textures and patterns of materials found on samples in the Building Material Samples Collection such as woven coconut shell panels or translucent concrete to the walls, floors, ceilings, and other surfaces in their designs. Samples of these materials are available for study in the collection, but the Revit file gives students the option of going beyond a simple material swatch and applying the material to surfaces in their designs. Wysor Grand Opera House 3D rendering (2014) and original drawing (1891). Indiana Architecture X 3D, Drawings + Documents Archive, Ball State University Libraries. A similar project at the Drawings + Documents Archive has garnered interest for its use of 3D prints to bring a long-lost 19th century building to life. The archive, begun shortly after the College of Architecture and Planning opened in 1966, collects, preserves, and provides access to records of Indiana’s built environment. Collections are used to support undergraduate and graduate student learning in the fields of architecture, landscape architecture, urban planning, and historic preservation. The students in the latter group, historic preservation, naturally gravitate toward the materials in the archives and readily grasp their usefulness for course assignments. It became apparent that students from the more technology-driven fields of architecture, landscape architecture, and planning would benefit from interpreting the collections in an interesting, technologically-centric way that brought the focus back to the original drawings. Thus, printing models from the drawings was born out of this desire to present the collections to students in a new way and spark their interest in archival materials. 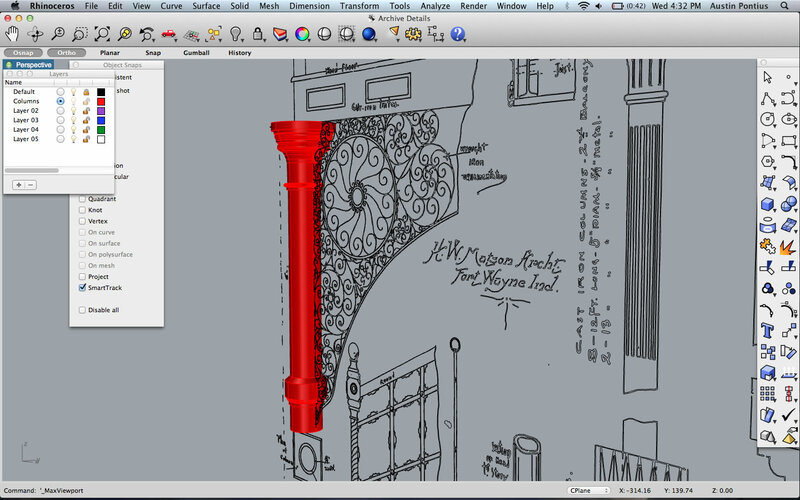 3D modeling process for column with wrought iron ornamentation and cast iron balcony railing, 2014. Indiana Architecture X 3D, Drawings + Documents Archive, Ball State University Libraries. The Indiana Architecture X 3D (IAx3D) project began in fall 2013 with a set of archival drawings for a local building with an interesting history. The Wysor Grand Opera House was built in downtown Muncie, Indiana, by the architect Henry W. Matson in 1891. This impressive Romanesque Revival opera house exemplified the architectural exuberance and rapid growth during the area’s natural gas boom that inspired numerous factories and businesses, including the famous Ball Brothers Company, to relocate to Muncie. The building’s history follows the changing fortunes and tastes of the city by undergoing renovations to become a popular movie theater in the 1920s that later lost business when other theaters opened outside of the declining downtown. The building was torn down in 1967, during a period of urban renewal that students today still try to comprehend. The Wysor Grand Opera House’s history, as well as the archive’s set of high-quality, ink on linen drawings, makes this building a great discussion starter for many class visits to the archive. For these reasons it seemed an ideal candidate for launching the IAX3D project. Architecture department graduate assistants assigned to the archive used digital scans of the linen drawings, first working with elements such as columns and wrought iron railings on the detail sheets, to create underlays in the program Rhino. On top of these, they traced over the lines to create baselines and used program tools to create volumes and surfaces. The process of converting irregular hand-drawn lines to smooth computer-generated forms proved challenging to the students working on the project, but it also increased their appreciation of the original drawings. Graduate assistant Austin Pontius remarked that as hard as it was to trace some of the drawings for the intricate ironwork, he was impressed that someone had drawn it by hand over 100 years ago. 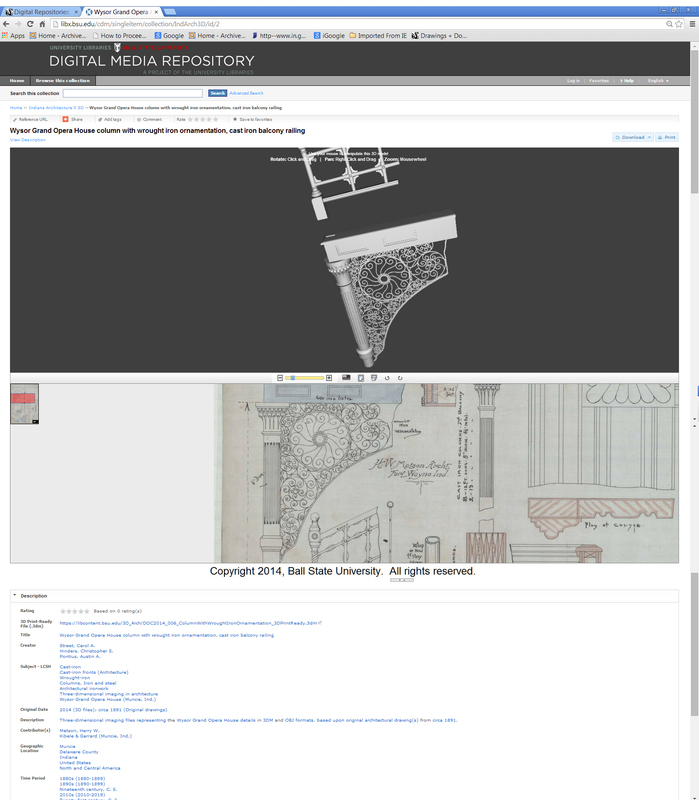 Digital Media Repository screenshot for column with wrought iron ornamentation and cast iron balcony railing, 2014. Indiana Architecture X 3D, Drawings + Documents Archive, Ball State University Libraries. Over the first year of the project, nine Wysor Grand Opera House details have been printed and the entire building has been modeled but not printed at this time. The entire collection is available online at the University Libraries’ Digital Media Repository. Each entry in the collection contains an object (OBJ) file to allow easy, computer mouse enabled manipulation of the 3D rendering for anyone with an adequate browser. The original drawing sheet from which that detail originated is pictured below the object to inspire comparisons from the digital to the original. The downloadable print-ready Rhino 3D model file (3DM) is available in the metadata in case patrons or educators would like to make their own prints. Student and faculty reaction to the IAX3D project has been enthusiastically positive. Because the models are created using technology many of the students use or aspire to use, students naturally gravitate toward them and begin to ask questions about the building’s history, design, or even the process of creating the models. While the 3D models could never supplant the importance of the original drawings, they do serve as a vital bridge that connects students’ current interests in 3D printing with historical materials. I think that it is really exciting that todays technology is finally showing the details, innovations, and styling that were made in the past, Those were and still are great designs. I have been documenting architectural cast iron in communities across Washington State and drawing them in CAD 2d some day soon I will convert to 3D and combine with building elevations. It is a work in progress.